21 degrees F this morning and I’m headed 40 miles back to Fort Robinson, Nebraska – another moment to appreciate being solo. 80 miles out of my way and there’s no one who gives a hoot! No such thing as “out of my way” on a trip like this. Fort Robinson is worth the backtracking. 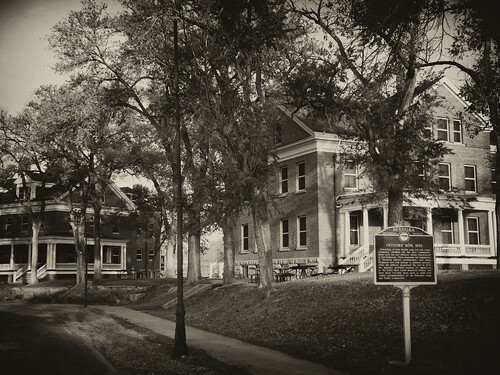 Built in several stages from 1874-1905 it served as a remote outpost on the plains. The post was part of the Red Cloud Agency (served as the issuing point for supplies to the Sioux, Cheyenne and Arapaho, authorized in exchange for land ceded to the US in 1868). After looking around for sometime the truck heads back to Chadron, Nebraska, then North on Highway 385 which will take me into South Dakota. There’s so much to see in this area of the U.S.! Although I’m here really for one thing — Mt. 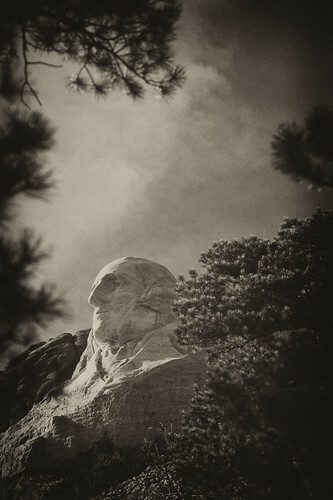 Rushmore, I decided to take a quick look at The Crazy Horse Memorial. Once there my anticipation of the meeting with four Presidents was more than I could overcome and I left without properly touring the memorial. Seen through the eyes of a pristine day, the experience of standing at the base of the cliff staring up until my neck hurt was more moving than I'd imagined. This picture of George Washington took some ground time -- as in rolling around on it. But the uniqueness of the perspective made it worth the effort. Shot with B&W film. As I’m departing the Mt. Rushmore area headed for Deadwood, South Dakota a small herd of mountain goats greet me as I round a bend. Another first for me! They’re close enough to touch, sort of like an animal farm, only not. I shoot away keeping the truck close just in case. Those little black pointy horns look wicked. Pulling up to the intersection of 385 and 85 – Lead (as in lead a horse to water) is 1 mile to my left, Deadwood the same to my right. I’ve never been here, heard plenty about Deadwood, not much about Lead so I decide to see Deadwood first. Just after turning right I catch a sign that says “chocolates”. The rest is Tammie Dooley history and a tasty one at that. Deadwood blows me away. Small, quaint, of historical significance for Western buffs, devoid of the summer vacation crowd it so intrigued me I decided to spend the night even though it was only 4:00 in the afternoon. Normally I would have taken a peek and driven on. The decision to spend some time here paid off as I had one of the most memorable times of the trip. After checking into the Holiday Inn Express just off the main street of downtown I consider postponing Mount Moriah cemetery and Wild Bill Hickok’s grave until in the morning, but change my mind just before parking the truck. 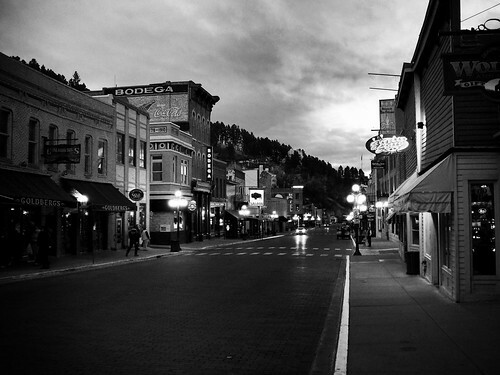 Deadwood is a walkabout town — the best way to see it is to park the vehicle and walk. The cemetery however is on the outskirts of town. Pulling into the cemetery parking lot I discover it’s a tourist attraction (Duh I swear I never thought of that!) and has closed for the season. Looking around at the dimming light and empty parking lot I deduce I’ll be the only visitor here this evening, so I climb over the iron fence. Fantasies of being able to brag “I was thrown into jail in Deadwood, South Dakota for trespassing” pumped the adrenaline as I begin trotting up and down the steep hill figuring Wild Bill’s headstone would be prominent. Dusk is coming on fast and just as I’m losing my nerve and calculating I’ve pushed my luck far enough, I spot his grave. Now I figure if I get caught I’ll at least have something to show for it. Quickly I take several pics, head back, climb over the fence, throw the money I had in my pocket into the box outside to stem my guilt, jump in the truck and immediately call my best friend. What a great laugh we had! I’m a grown woman trespassing on revered property. Shameful. But FUN. Back in town with a felony under my belt, and if it wasn’t, it felt like one, I park the truck in the hotel garage off a side street and begin walking around. Have dinner at Kevin Costner’s sports bar. Strolling the town with a drink in me and a great meal the town lights are all shining now and besides a few gambling tourists, the streets are deserted. In the crisp October air Main Street was beckoning and so very magical. I spot a sign identifying Saloon 10 as the bar where Wild Bill was shot and killed. I walk in. It’s dimly lit. I’m the only customer! The bartender smiles as I walk up to the bar. “So what WAS Wild Bill drinking when he got shot? !” He replies with no hesitation “Why whiskey of course!” With a slam of my hand to the bar, “then that’s what I’ll have!” Breaking the law in a town with a history of breaking the law had given me a frightening degree of boldness. Here’s to… Aces and 8s… Nah, that’s Just WRONG. Here’s to the Wonder of History to which Wild Bill contributed. There was NOTHING dead about this Town! Love Deadwood! You need to go see Crazy Horse during the first weekend of June for the Volksmarch. Its a 10k that takes you right up to Crazy Horse’s face…after this you’ll never give Mt. Rushmore another thought! Mt. Rushmore is one of my favorite spots (one of many lol). Last time I was there about a year past, it was thundershowering most of the day. When I got there, the showers quit for a while and I was able to get some good shots and enjoy a nice walkabout. Great place! Here’s a salute to some of our greatest leaders. Your descriptive writings bring about such wonderful memories. I can see that cemetery as though I were there yesterday instead of 10 years ago. A travel review by you should be sought after by every Chamber of Commerce in the USA.